TR series - 3 models in 3.6 m, 4.0 m, and 4.3 m. These are tiller handle small RiBs, with under deck 12 gallon capacity fuel tanks. Open deck for cargo. Great for quick recon, S&R operations, and use in tight / shallow areas. MX series - 18’ Jockey seat RiB, powered by either twin F50, twin F60, or single F115 O/B. Good all-around foul weather boat. Heavy sea conditions are easier handled with this deck configuration. DL series -The large DL’s, in 6.5 m, or 7.5 m. Large C.C. RiBs with single or twin O/B power options up to 300 Hp. Multiple deck and seating configurations available. T-Tops or Radar arches, in Aluminum or S.S. Great all around use boat with availability for lots of cargo room, or lots of seating; depending on use. Catamaran Series - 18’, 20’, 24’, and 28’ Catamarans, with hydraulic bow ramp. 18’, 20’, and 24’ powered with single O/B. 28’ powered with dual O/B power. Multiple console, deck layout, and seating arrangements available. The new NOVURANIA Professional Series RIBS are a sensible solution to the work boat market. They are lighter, carry a heavier payload, and reduce liabilities or possible damage around other boats. 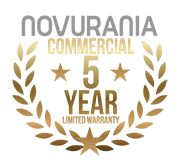 Known worldwide as a leader in the manufacturing of luxury yacht tenders, NOVURANIA has produced applicable commercial boats for the United States Coast Guard, US airports, and fire departments as well as others. Inside every luxury tender we make is a work boat crafted to strict specifications. As the leading manufacturer of commercial yacht tenders, innovation is apparent in every model of our comprehensive line of boats. Our in-house engineers, equipped with the most advanced hardware and software applications, continue to introduce new models based on the needs of our direct clientele. 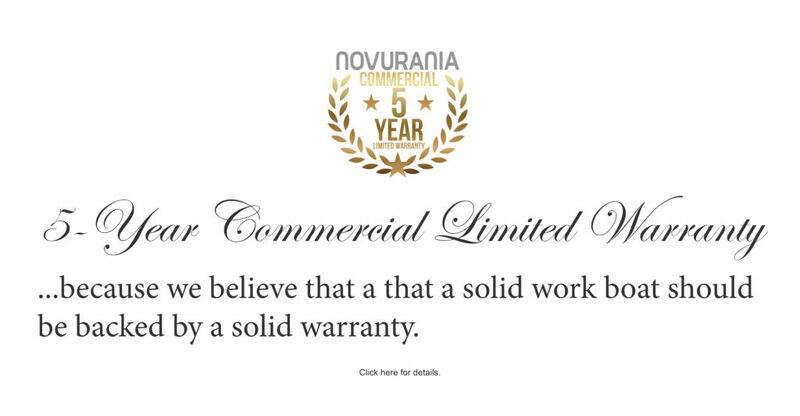 Leading the industry through innovation has always been paramount at Novurania. © 2018 Novurania of America, Inc. All rights reserved. • Website & Marketing by Vero Beach Marketing.